From Goodreads: For many years, television comedy was an exclusive all boys’ club—until a brilliant comedian named Carol Leifer came along, blazing a trail for funny women everywhere. From Late Night with David Letterman andSaturdayNight Live to Seinfeld, The Ellen Show, and ModernFamily, Carol has written for and/or performed on some of the best TV comedies of all time. 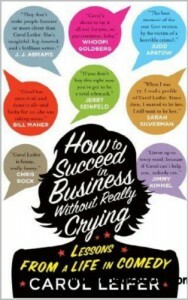 Part memoir, part humor and part how to manual; How to Succeed in Business Without Really Crying surpassed my expectations. Not having heard of Carol Leifer before (even though I really enjoy Seinfeld), I figured that this would be one of those books I'd glance through but ultimately put down in favor of a novel. Instead I read this straight through with no problem. It was funny and touching but most of all, I found that this book was a cleaverly disguised how to book....one that I actually found I took to heart rather than mocked in scorn. Even though I have no intention of going into showbiz, the lessons supplied in this thin book can be applied to any number of life events. Lessons I have already subconsciously added to be own life and many others that I want to work towards. Even if you are like me, and hate the idea of reading self help books...do yourself a favor and read this one.